The Wall of Honor at Mt. San Antonio College says it all. There is so much going on this weekend that I can’t possibly rank the best matchups. I’ve broken them into three categories: Boston Marathon, Mt. 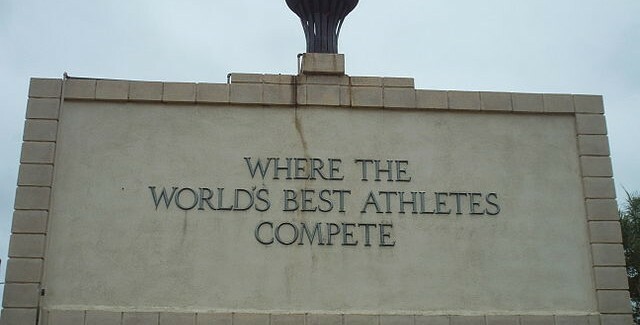 SAC Relays, and everything else. The Boston Marathon would go first in any year, but one year after the horrific bombing it’s getting extra attention. Those matchups are arranged topically. The Mt. SAC Relays matchups are arranged chronologically, and the others are arranged…well, just however. Let’s take a look at what’s coming at you this weekend. The Boston Marathon is road racing’s Kentucky Derby, the one day a year that our kind of racing gets widespread attention. The only good thing that came out of last year’s bombs was that this year’s race is getting more attention than usual. The Derby and the marathon bring the same questions, too: when will it finally happen? It’s been 36 years since a horse won the triple crown. It hasn’t been that long since an American won Boston, it just feels like it. Hope springs eternal for each. This year’s chosen one is Shalane Flanagan, who has been on 60 Minutes (the first marathon profile the show has ever done) and ESPN (not the first time they’ve interviewed a runner, but again it feels like it). And Flanagan just seems so right. She’s a Boston native with an Olympic medal, an Irish name and Irish face and hair. The kind of combative female character from the blue-collar Northeast that David Russell (The Fighter, Silver Linings Playbook, American Hustle) has made a career out of showing us. And, of course, she can’t win. There are too many great runners in the race for her to win. There are 14 other runners with PRs better than hers, three of whom have run more than five minutes faster. But the thing to remember is that in a field as deep as Boston’s, and in a race as unforgiving as the marathon, everyone is a long shot. Even favorites like Rita Jeptoo and Jemima Jelagat are facing enough talented competition that they’re also unlikely to win. But somebody has to win. Meb Keflezighi, the marathoner who has pulled more rabbits out of his hat than anyone, says you don’t have to beat everyone. He says a third will have beaten themselves in training and won’t come to the starting line at 100%, and another third will beat themselves during the race. You only have to beat the remaining one-third. All week, the ever-irreverent Deadspin.com has been providing snarky profiles of the Boston Marathon’s pro entries. The smartass who has been writing them, Ray Fontaine, knows his stuff. 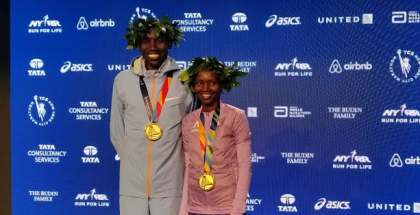 He identifies Kimetto and Desisa as the two favorites, noting that Kimetto won two majors last year (Chicago and Tokyo), both in course record time, and that in his race before those two, he conveniently finished one second behind a teammate who got a $500,000 bonus with the win. There aren’t many guys who can run in fast conditions (Dubai), hilly conditions (Boston), and warm conditions (World Champs), but Desisa is one of them. Throw in the fact that he’s the 24-year old defending champion, and you would think he’s a near-lock to win. He only has one problem: Dennis Kimetto. Well, two: the marathon is a highly unpredictable race that can reduce even the best athletes on the planet to a quivering shell of their former selves. But there’s post-race beer and a DJ! The rest of the men’s field includes two more with sub-2:05 PRs (Gebre Gebremariam, Markos Geneti) and three more who have run under 2:06 (Wilson Chebet, Tilahun Regassa, Shami Dawud). US hopes ride on veterans Ryan Hall, Meb Keflezighi and Abdi Abdirahman. That’s not good, because “veteran marathoner” means “best days are behind you”. Hall hasn’t finished a marathon in more than two years, and Abdirahman is consistent but never brilliant. Keflezighi is pretty much the lone exception of the last half-century to the “veteran marathoner” rule, but he’s got to succumb to age someday. Jason Hartmann has finished fourth in each of the last two Boston Marathons–but has also DNFed in each of the last two Chicago Marathons. On marathon morning three years ago, one of my co-workers said “I see there’s an American woman who could win Boston”. He was referencing the Kara Goucher profile that ran in that morning’s USA Today. I replied that there was an American woman who could win, but it wasn’t Goucher. I told him to watch a woman named Desi Davila, who would be wearing the easily identifiable colors of the Detroit-area Hansons-Brooks team. As they turned for onto Hereford Street with less than 800 meters to go, there was Desiree Davila of Hansons-Brooks, the most overlooked woman in American marathoning (hell, we even said this about her this week in our preview: “… the notion of her winning Boston at this stage in her career isn’t a realistic one …we think Davila has zero chance of winning.”) battling for the win. Throughout the race, multiple times it seemed like Desiree was just hanging on. At 15k, she fell 13 seconds off of the chase pack that had probably 10 women in it. She fell off the pack again after the 1:40 mark (she was 4 seconds back at 30k), but then there she was during the final miles battling for the win with Caroline Kilel and Sharon Cherop. …Next thing I knew, Davila was leading the Boston Marathon with less than 400 meters to go. At this point, I imagine if you were watching Boston all across America, you spontaneously did what I and Alberto Salazar did — you stood and screamed at the TV/computer screen. In the end, the record will say that the storybook victory did not occur for Davila, as Kilel had her own dreams of greatness and managed a way to dig deeper herself to get the win before collapsing after crossing the finish line. While Kilel was the champion, Desiree was the embodiment of the very best that the sport has to offer. Davila returned to a hero’s welcome in Detroit. She threw out the first pitch at a Tiger’s game to thunderous applause. She was featured in Chrysler advertising. She gave a shot in the arm to the city of unknown successes, the city of Bob Seeger and Elmore Leonard and St. Cecilia’s gym. And it never occurred to anyone that this might be as good as it would get. Since that historic Boston race, Davila took a safe second in the Olympic Trials, got injured, struggled through a few miles of the Olympic marathon before dropping out, and has taken a long and winding road back to health. She got married, changed her last name to Linden, trained for this race in Kenya with Canadian record holder Lanni Marchant. Linden says she’s ready to go but really isn’t sure. Maybe that race three years ago will be her greatest athletic achievement. Or maybe not. Maybe we will once again stand up and scream as she comes down Boyleston Street. Over the last few years the B.A.A. 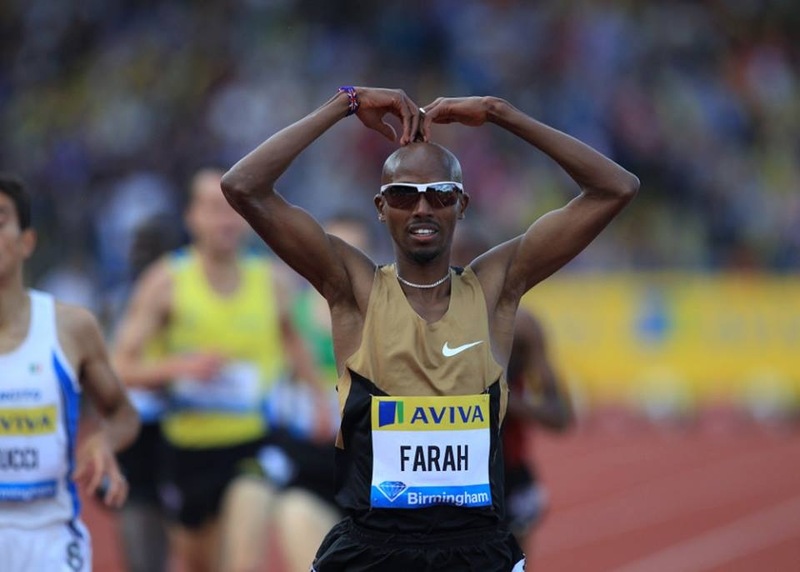 has developed two undercard races for Monday’s Boston Marathon, a 5k and a road mile. For the mile, the men’s race looks to be the better of the two races as it brings together the last two Olympic silver medalists at 1500 meters. Willis recently reported that he hit his biggest milage in eight years (96 miles for the week) and that recent years’ injury struggles are behind him. Manzano just signed a contract with Hoka One One after a long period of being without a sponsor. 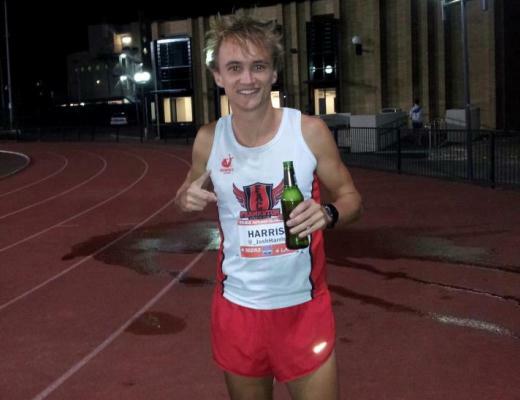 British miler Chris O’Hare is probably he next best runner in the race. The women’s race is headlined by two-time champion Morgan Uceny, who was the world’s dominant 1500 runner two years ago but has struggled since then. Her biggest competition will likely come from Ethiopia’s Kalkidan Gezahegne and road mile specialist Heather Kampf. The men’s and women’s races in the B.A.A. 5k include two of the very best runners the USA has to offer, Molly Huddle and Ben True. Both are capable of running with and beating all but the very best in the world–and that’s exactly who they’ll face on Saturday. US runners may have made huge improvements over the last decade or so, but it will be a whole new ballgame when they start winning races like this. Huddle is the US record holder at multiple distances, including 5000 meters. She was third in this race last year, and her most decorated challenger is Linet Masai, a World Championships gold and bronze medalist. Three other entrants have won major road races in 2014: Mamitu Daska (Cherry Blossom 10 mile), Mary Wacera (World’s Best 10k), and Julia Bleasdale (Carlsbad 5000). Ben True is about one step short of being a legitimate star. He led the US team to its miracle silver-medal finish at last year’s World Cross Country Championships, then finished in the dreaded 4th place at the US Championships in both the 5000 and 10,000 meters. He faces a tough Ethiopian pair, Dejen Gebremeskel and Hagos Gebrhiwet. Both have run under 13:00 on the track and both have won silver medals, Gebremeskel at the 2012 Olympics and Gebrhiwet at the 2013 Worlds. What makes this an interesting matchup is that neither of the above are running in their main event. Conley specializes in the 5k and Wright in the 800. Watch Hilary Holt, who runs for the NAIA College of Idaho–she might be the best collegian in the race and one of the best in the nation. The top two entries in the Mt. SAC Relays steeplechase also happen to be two of the best steeplechasers in Canadian history. Hughes broke the long-standing Canadian record last year while finishing sixth at the World Championships. Genest was also a finalist in that race. Dartmouth’s D’Agostino has dominated college distance running for the last two years and came inches away from making the 2012 Olympic team. Martinez is an 800/1500 runner (and Worlds silver medalist in the shorter event) using this race for early-season strength training. Jordan Hasay is a big name in this race but I can’t see her beating either of the above. Watch Boise State’s Emma Bates, who had a great cross country season. Races like this allow the best collegiate relay teams, such as Oregon, to be in the situation of running against the kind of superior talent they don’t see in purely collegiate competition. There are two Bobby Kersee coached teams in this race, and one includes Dawn Harper, Jeneba Tarmoh, and Allyson Felix. A Nigerian team includes Blessing Okagbare, one of the world’s best sprinters. Oregon’s collegiate competition will come from USC. These two are clearly the best vaulters in the NCAA. Barber beat Kendricks at the NCAA indoor championships but then no-heighted at the Texas Relays and Kendricks went on to win. Batson (Alabama) and Brown (USC) are two of the best sprinters in the NCAA. Batson recently ran a wind-aided 10.01, and Brown was a Worlds semifinalist last year for Canada. Neither is likely to win, though, as pros Mike Rodgers and Isiah Young are in lanes 4 and 5 between them. Solomon finished just outside the medals at the 2012 Olympics and 2013 Worlds and is one of the very best in the world. Sowinski has had his number over the 2013 and ’14 indoor seasons, but is still trying to find his feet outdoors. Former 400 hurdler Brandon Johnson was the find of the 2013 season in this event and is entered as well. Oregon’s Roesler is undoubtedly the top collegian right now and a big-time up-and-comer on the national stage. Lara (nee Gall) and Vessey have made international teams but are still outside the top few Americans, so this is a race to see who is queen of the second tier–and who might be ready to break into the first tier. Canada’s Diane Cummins turned 40 years old in January but is still seeded into the fast heat. Hurdle races tend to bring together strong fields and this is no exception. The USA’s Ali and Canada’s Whyte are probably the two best entries, but there is plenty more. Brianne Theisen-Eaton and Jessica Zelinka are the two greatest heptathletes in Canadian history and they run next to each other in lanes 1 and 2. NCAA indoor champion Sharika Nelvis (Arkansas State) is here, along with first year post-collegians Vashti Thomas and Kori Carter. Journeyman Wilson finally broke through last year to elite status and won silver at the World Championships. Osaghae won gold at the World Indoor Championships and might be America’s next top hurdler. Hitchon and Frizell are the national record holders for Great Britain and Canada, respectively, and Campbell is one of the best in the USA. Three more top Americans are present in Gwen Berry, Britney Henry, and Chelsea Cassulo. Williams won the World Championships gold medal in 2011 but struggled with injury last year. He appears to be back to full power now. Mason is an Olympic finalist whose best mark this year is better than anything Williams has cleared since last year’s Mt. SAC Relays. Eaton is so dominant at the decathlon that he’s taking a year off from it to work on the 400 hurdles, which isn’t a decathlon event. It’s an amalgam of the 400 meters and the 110 hurdles, both of which he’s very good at by anyone’s standards, let alone a decathlete’s. This will be his first official race in the event and he’s up against a couple of world-top-ten types, Isa Phillips and Jeshua Anderson. For three years, the Kansas Relays has put on a men’s shot put competition in the middle of an intersection in downtown Lawrence. The meet pulled its financial support of the event this year, so it’s not technically part of the Kansas Relays, but local donors stepped up to keep the event going. The overwhelming favorite is Ryan Whiting, the world indoor champion and the world’s #1-ranked shot putter. He’s not invincible, though, and Reese Hoffa might be able to top him like he did at last year’s Drake Relays. Hoffa, the showman and Neil deGrasse Tyson lookalike, is on the comeback after missing three months due to a knee injury. In all, there will be nine professionals competing. Whiting’s the favorite, Hoffa the crowd favorite, Christian Cantwell the guy who will play the role of villain for no reason other than that he used to compete for Missouri. Hoffa defeated Cantwell on his final throw of the day two years ago and dramatically pointed to the left side of the landing area. Track and field needs big personalities and the kind of over-the-top pre- and post-competition interviews that professional wrestlers used to subject Mean Gene Okerlund to. Shot putters rarely disappoint in this department. I have been unable to find a website for this event or a complete list of entries. Reports conflict about whether this will be part of ESPN3.com’s coverage of the Kansas Relays. To be quite honest, much of the collegiate competition at the Oregon Relays does not appeal to me. It’s mostly small-college athletes, and large parts of the Oregon team are competing at the Mt. SAC Relays. But the men’s 5000 meters is going to be a great race. The attention-grabbers are Centrowitz, the Oregon Track Club’s standout pro miler, and Cheserek, Oregon’s freshman ace who has already won three NCAA titles. 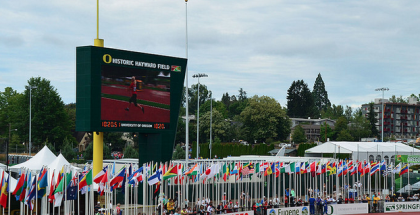 It will be the first race of the year for Centro and the first race at Hayward Field in an Oregon uniform for Ches. There’s a lot more than just these two to watch. Eric Jenkins, a budding star at Northeastern who transferred to Oregon, will make his debut as a Duck. All-American Parker Stinson is entered, as is long-distance specialist Luke Puskedra, a former Duck who now runs for the Oregon TC. But as far as I’m concerned, the smart money is on the Nike Oregon Project’s Cam Levins, one of the fastest runners in Canadian history. If the USTFCCCA’s computer rankings are meaningful for conference championship competition (and that’s sometimes a big “if”), then Florida State’s men are overwhelming favorites to win the ACC for the fourth time in the last five years. The women’s competition might be a bit closer, though, as Notre Dame is a threat to win in the Fightig Irish’s first year in the conference. In terms of individual matchups, the events to watch are the men’s 400 meters and 4×400 relay. The individual race should be a tight battle between Pitt’s Brycen Spratling, Notre Dame’s Patrick Feeney, and Florida State’s James Harris. The relay looks to be close between Pitt and North Carolina. Jones got big attention for her foray into bobsled over the last two winters, but it looks like she’s not yet done with hurdling. This will be her first hurdle race since last June’s USATF Championships. She gets tough competition right off the bat in LSU’s Jasmin Stowers, who was third at the NCAA indoor championships. Other top matchups in this meet include Texas A&M’s Deon Lendore against LSU’s Vernon Norwood in the 400 meters (2:15pm local time), LSU’s Nikita Tracey against Janeil Bellile in the 400 hurdles (3:05pm), and recent LSU grad Kimberlyn Duncan against Texas A&M star Kamaria Brown in the 200 meters (3:15pm local time). This is a very good meet and something I hope the SEC Network will cover next year. These two are stalwarts on US national teams in the hammer throw–they’re the only two who can regularly meet the tough qualification standards. They have some shared history; Johnson is a graduate of Ohio’s Ashland University, where Kruger is employed as the strength and conditioning coach. Kruger has won four out of their five head-to-head meetings over the last two years, but before that Johnson beat him five times in a row. There are a few pretty good collegians in the field too, including Findlay’s Justin Welch–owner of the longest throw in D-II history by an athlete not from Ashland.